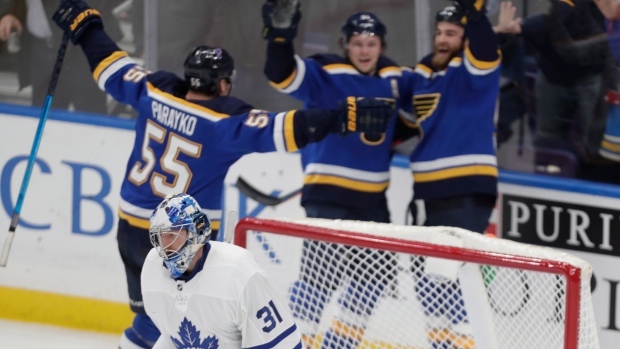 ST. LOUIS — In the beginning of the season, the St. Louis Blues were finding ways to lose games. Now, they're managing to pull out wins. "It's fun hockey," O'Reilly said. "We're really enjoying it. You see from the start of the year how frustrating it was and how we kept working and working and not getting the result. Now, you see the way we've come together and everybody's invested in each other. Everyone's trying to make it easier for the next guy. Again, that wasn't a perfect game." "He (Mitch Marner) was winding up there, I kind of saw that he had me beat already so just went flying — just a desperate play, trying to get back," O'Reilly said. "Saw (Blues goalie Jordan Binnington) went down and he was going to try and throw it in front, got my stick down and luckily it turned into a 2-on-1 for us." Jaden Schwartz and Colton Parayko also scored and Tyler Bozak had two assists for the Blues. Binnington made 29 saves to win his ninth straight, extending the longest winning streak in franchise history for a rookie goaltender. Hyman scored at 6:34 of the third, snapping the Blues' shutout streak at 233:50. Matthews followed just 31 seconds later as the puck deflected off his skate past Binnington. It was Matthews' first career point in six games against the Blues, who were the only team he didn't have a point against. "I would have liked to seen us crawl our way back and win the game, but I thought we did a lot of good things today in the latter half of the game to set us up for success and I was impressed with a lot of our play," Maple Leafs coach Mike Babcock said. Schwartz gave the Blues a 1-0 lead midway through the first, scoring off a backhand feed from Bozak. Alexander Steen started the play, forcing a turnover in the Maple Leafs' zone. Parayko made it 2-0 with a power-play goal with 2:18 left in the first. Parayko's shot was initially ruled off the post. Once play was stopped nearly 20 seconds later, a review showed the puck hit the bar and went in. Parayko didn't think it went in initially. "I thought it hit the post because I didn't see anybody react," Parayko said. Toronto centre Nazem Kadri left the game with a concussion after the first period. Kadri took a big hit from Vince Dunn early in the game. NOTES: Blues F Vladimir Tarasenko had his NHL-high 12 game points streak snapped. Tarasenko was named the NHL's second star of the Week on Monday. He had four goals and six assists and was plus-7 for the week ending Feb. 1. ... Maple Leafs LW Andreas Johnsson returned to the lineup after missing one game with a leg injury. ... The Blues scratched C Robby Fabbri and D Chris Butler. ... The Maple Leafs scratched D Justin Holl, C Tyler Ennis and D Igor Ozhiganov. Maple Leafs: Host Washington on Thursday night. Blues: At Dallas on Thursday night.